The president falsely said “prior to last year” the amount other NATO countries spent on defense “was going down and down very substantially.” In fact, NATO Europe and Canada increased defense spending in 2015 and 2016. Trump also was wrong when he said that “many countries [in NATO] owe us a tremendous amount of money for many years back, where they’re delinquent … because the United States has had to pay for them.” Countries in the alliance that spend less than 2 percent of their GDP on their own defense are not required to pay countries that do. The president repeatedly claimed that “everyone has agreed to substantially up their commitment.” But leaders of several European nations later said there were no formal agreements to increase spending beyond previously set goals. At his press conference after the summit, Trump criticized NATO countries for failing to meet a commitment they made in 2014 to increase their defense spending to at least 2 percent of each country’s gross domestic product within a decade. The countries memorialized that commitment at the Wales summit in September of that year after then-President Obama urged the allies to increase spending to combat Russia’s aggression in the Ukraine and the terrorist group known as ISIS. Trump, July 12: Prior to last year, where I attended my first meeting, it was going down — the amount of money being spent by countries was going down and down very substantially. Trump’s first NATO meeting was in May 2017 — about two-and-a-half years after the commitment NATO countries made in Wales to increase defense spending. 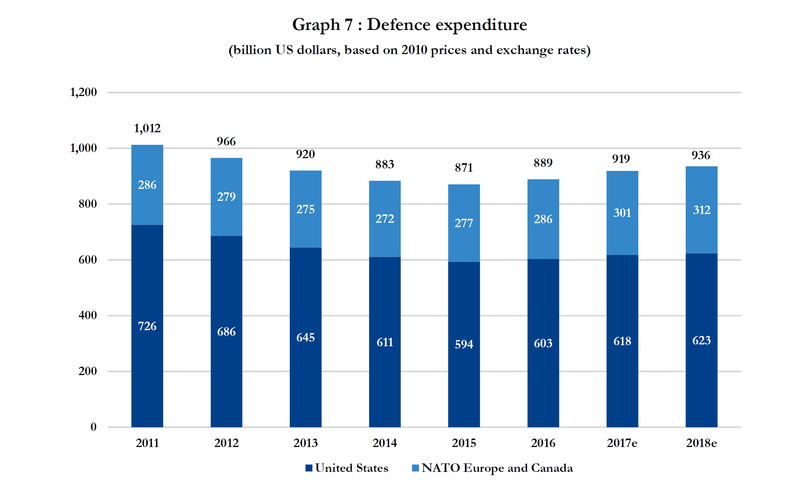 As shown in the chart below from a July 10 NATO report, NATO Europe and Canada responded by increasing defense spending by 1.83 percent in 2015 and 3.14 percent in 2016 before Trump attended his first meeting. 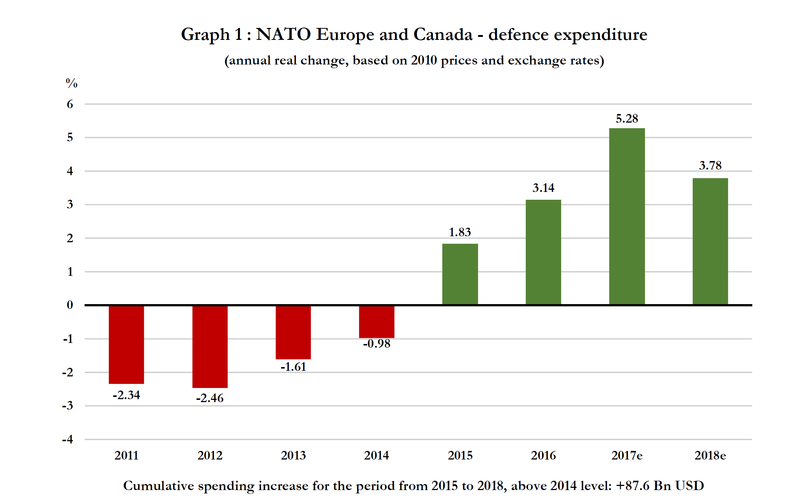 In constant 2010 U.S. dollars, NATO Europe and Canada increased their defense spending by $14 billion, or 5 percent, from 2014 to 2016, as the chart below shows. NATO Countries Don’t Owe Money to the U.S.
Trump, July 11: And, frankly, many countries [in NATO] owe us a tremendous amount of money for many years back, where they’re delinquent, as far as I’m concerned, because the United States has had to pay for them. So if you go back 10 or 20 years, you’ll just add it all up. It’s massive amounts of money is owed. But Trump is again referring to the amount of money that countries independently decide to spend on their own defense budgets. There is no requirement that countries that spend less than 2 percent of GDP on defense reimburse those countries that do. The president’s statement “is not accurate,” Christopher Preble, vice president for defense and foreign policy studies at the libertarian Cato Institute, told us in an email. “NATO countries do not owe the United States money. And the commitment they made to reach the 2% of GDP threshold was to have done so by 2024,” Preble wrote. “NATO member states fund their own militaries. They don’t pay us to fund ours,” he said. In fact, for the majority of the 29 countries in the alliance, the 2 percent of GDP benchmark is just a “guideline,” not a mandate. As of 2018, only four members of the alliance “have either national laws or political agreements which call for at least 2% of GDP to be spent on defence annually,” according to NATO. They are Latvia, Poland, Lithuania and Romania. Trump repeatedly claimed that “everyone has agreed to substantially up their commitment.” But leaders of several European nations later said there were no formal agreements to increase spending beyond previously set goals, and none was provided by NATO. Asked during a press conference for details about new commitments agreed to at the summit, NATO Secretary General Jens Stoltenberg said only that everyone “developed a better common understanding of the challenges, the urgency of spending more” and that allies had promised to “redouble their efforts” to increasing defense spending. However, Trump left the impression that specific new commitments for funding had been agreed upon. Trump, July 12: The commitments are made at a higher level than they’ve ever been made. And the money, it will be paid out faster — far faster. You know, the 2 percent was a range, a goal. It wasn’t something that they were committed to. Now it’s a commitment. There’s a big difference — the 2 percent number. And that’s why so many people weren’t reaching it or hitting it. It was just sort of like this amorphous number out there. Now it’s a commitment, a real commitment. As we explained, in 2006, NATO members agreed to try to spend at least 2 percent of their gross domestic product on defense spending. And in 2014, they agreed again to aim to meet that standard by 2024. After the summit, several NATO leaders said no new commitments had been made that would alter those agreements. “It confirms the goal of 2 percent by 2024. That’s all,” said French President Emmanuel Macron. According to NATO figures, Germany, France and Italy spend 1.24 percent, 1.81 percent and 1.15 percent of their annual GDP on defense, respectively. In a press conference after the summit, a reporter for the Washington Post asked Stoltenberg for details on any new commitments agreed to in the meetings. Trump repeated several other inaccurate claims that we have written about before. Trump repeated the inaccurate claim that the U.S. is paying “probably 90 percent of the cost of NATO.” But as we wrote recently, the U.S. share of the commonly funded NATO budget is just over 22 percent, according to NATO’s most recent figures. Trump is conflating the cost of operating NATO with the amount NATO countries spend on their own defense, which for most is below 2 percent of GDP. The U.S. share of total defense spending by all NATO members in 2017 was an estimated 67 percent, according to inflation-adjusted figures from NATO. Trump again wrongly claimed that Wisconsin was the one state Ronald Reagan lost in 1984. “One of the states we won, Wisconsin — I didn’t even realize this until fairly recently — that was the one state that Ronald Reagan didn’t win when he ran the board his second time,” Trump said. “He didn’t win Wisconsin, and we won Wisconsin.” In fact, Reagan won Wisconsin in 1980 and again in 1984, and pretty handily at that. And finally, Trump repeated the claim that he opposed the Iraq war before it started. “I was not in favor of that war,” Trump said. “I was very much against that war. I never thought it was a good thing. But that’s another deck of cards that I inherited, and we’ll do the best we can with it.” As we wrote many times during the 2016 campaign, there’s no evidence he publicly opposed the war before it started, though there is some evidence he supported it. "Prior to last year, where I attended my first meeting, it was going down — the amount of money being spent [on defense] by [NATO] countries was going down and down very substantially." "Many [NATO] countries owe us a tremendous amount of money for many years back, where they’re delinquent, as far as I’m concerned, because the United States has had to pay for them." At the NATO summit, “everyone has agreed to substantially up their commitment” to increase defense spending.